Most of this website has dealt with reducing CO2 emissions to limit the total effect climate change has on us over the next few generations. This is only half of the solution, however. If we truly want to limit the amount of climate change we are going to experience, we will also need to work to take CO2 out of the air and store it somewhere that it can't get back into the air. This is a process referred to as sequestration. The carbon that we are currently putting into the air comes from deep inside the Earth, either from oil, coal, or natural gas. 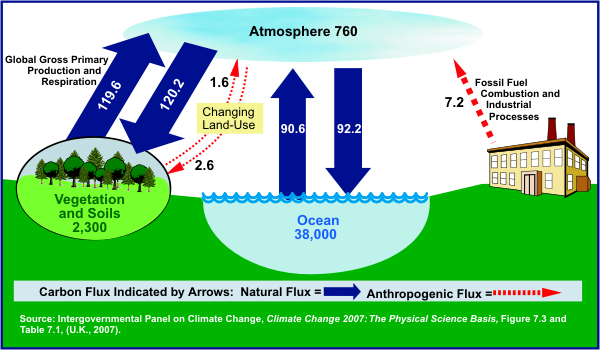 We are introducing this to the terrestrial carbon cycle, an image of which is shown below. The carbon cycle is an important concept to understand when talking about climate change. It is important to think about where the CO2 you are emitting comes from and where it will go. On a simple level, if we are taking carbon out of the Earth that has accumulated there over millions of years, we need to both take less of it out, and also find a way to put it back if we are going to reduce the amount of CO2 in the air. As you can see from the cycle below, the carbon we are putting into the air doesn't have anywhere to go right now and so will stay in the atmosphere. Unfortunately, the processes that do this naturally take a long, long time. One of the solutions often proposed to sequester carbon is to plant more trees. Trees use the carbon in CO2 to become bigger. This will in fact pull CO2 out of the air, until that tree is either burned or dies and decays, releasing the carbon that it used to grow itself as a part of the normal carbon cycle. The only way to turn a tree into a carbon storage mechanism is to turn it into a table or some other product that has a sufficiently long lifespan. In order to have a large effect, we need to put the carbon we have been releasing for the last couple hundred years back into the ground where it came from. This involves a 3 step process: 1.Stop putting so much carbon in the air; 2.Pull carbon out of the air; 3.Find a way to bury it so that it is removed from the short term carbon cycle. Much of the rest of this website focuses on this first step. It is important to keep in mind that the carbon you are currently emitting, we don't have a good way of removing from the air yet. This section will focus on the other two steps. There are no real easy answers for how to do this yet, but that's why it's important to talk about it. Tomo Says:Becoming a supporting member is easy. Just donate any amount to SixLinks monthly. Really, that's it, and that's how we keep running!